Two men are now remanded prisoners after being jointly charged with the recent Cromarty robbery in which a man was shot to his face. Delroy Parks, 30, also known as ‘Jah Jah,’ of Cromarty Farm, Corentyne, and Nathan Dukhi, 30, of Phillipe Farm, Corentyne, yesterday appeared at the Number 51 Magistrate’s Court before Magistrate Charlyn Artiga, who read the charge that on Tuesday, October 9th, in the company of another and armed with a gun, they robbed Deeraj Kumar of $280,000 at Cromarty Farm, Corentyne. The two unrepresented accused were not required to enter a plea to the charge. Police Prosecutor Lennox Poliah told the court that the case file has not been completed and that the matter was still under investigation. 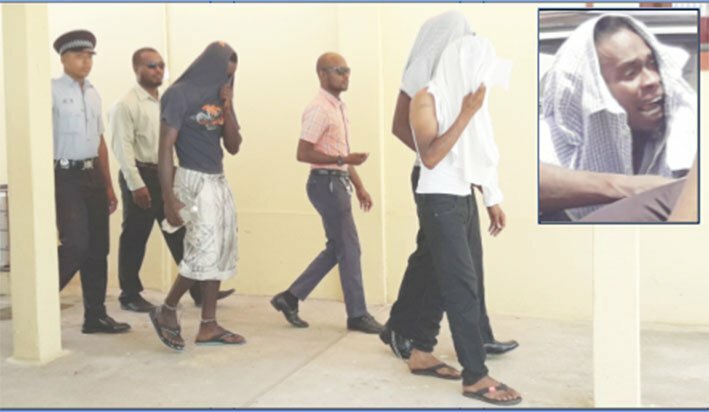 When asked by the magistrate, he said a firearm was not recovered and that the men were not swabbed for gun powder residue. Nonetheless, he objected to bail, saying that the accused were identified by the victims. He also noted the prevalence of the offence. However, both Parks and Dukhi claimed in court that they were at their separate houses during the time of the robbery. Despite their denials, Magistrate Artiga refused bail and remanded both men to prison. Stabroek News previously reported that Balram Kumar, 22, was shot to the left side of his face and was also beaten about his body with a cutlass when armed bandits pounced on his family on Tuesday around 6 pm at their Cromarty Farm home. His father, businessman Deeraj Kumar, 52, was also battered by the bandits. The two men are hospitalised at the Anamayah Memorial Hospital. Meanwhile, Dukhi and Floyd Kite, 24, of Cromarty Farm, were charged jointly yesterday with a break and enter and larceny. It was alleged that on Monday, October 8th, they broke and enter the dwelling house of Candacia Mathew and stole a silver chain, valued $43,000, and a silver ring, valued $8,000. The unrepresented men pleaded not guilty to the offence and were granted their release on $20,000 bail each. Dukhi, however, will remain imprisoned as a result of being remanded on the separate armed robbery charge. The court was told that all of the jewellery was recovered after Kite reportedly led investigators to where it was hidden. The next hearings for the three men will are now scheduled for the Whim Magistrate’s Court on November 1st.